Imagine, you and your family are new in the neighborhood and you are not entirely sure what the culture of this neighborhood is like. Do people mow their lawn in a horizontal or diagonal pattern? Does anyone care about how you mow? How early can you mow on a Saturday morning without annoying your neighbors? How does everyone feel about garage doors? Must they remain closed at all times or can they be open sometimes for convenience? What day is trash picked up, or recycling? These are all mundane questions, but the answers are important for successfully blending into a neighborhood. Now, imagine yourself in this same neighborhood and when you ask a question, your neighbor responds with a puzzled look, which you conclude means that they do not understand. Your neighbor says something in turn, and you respond with a puzzled look and a shrug. You both awkwardly smile and retreat. After a time you acquaint yourself with the neighborhood norms through your powers of observation. You comply with the mowing and garage door preferences and life on the cul-de-sac is good. Now imagine that you have arrived in a new neighborhood after fleeing violence and oppression in your home country. Life is difficult, but you are hopeful that you can provide a safe healthy home for your children. You find yourself being talked at by a lot of people in your life. As you wait in line for a bus, you are anxious because you are not sure of where you are going, or the correct bus to take. You ask those around you, but communication is all but impossible. Imagine how your parenting might be affected by your English proficiency. Many immigrants experienced barriers to school attendance in their country of origin. They are thankful that education is accessible to their children and view education as a way to financial security through meaningful work. Without fluency in English, accessing public education for your children is difficult. There are a myriad of details to attend to when enrolling a child in school, a task made more difficult by a lack of fluency in English. Once enrolled, children will ask their parents for homework help. Giving this help is challenging for all parents, but even more so if the instructions are in a language of which you have only rudimentary knowledge. 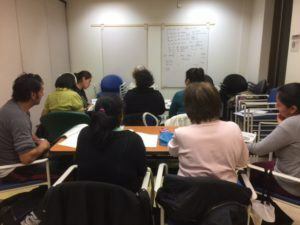 Accessing health care without a good understanding of English is another area that is problematic for immigrants with limited English. How can you make an appointment for your sick child with the doctor? How do you explain your child’s symptoms to a nurse? The ability to accomplish everyday tasks like these is essential for parents. Imagine having to do it if you could not understand the voice on the phone, or the words on the page. Overcoming all of these obstacles is contingent upon the first, learning a new language. The other obstacles can be more easily mitigated if communication is clearly understood. 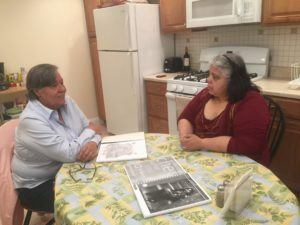 Because of this, educational and language programs at Mary’s Pence grantee, Centro de Recusos Educativos para Adultos (CREA) are critical to the success of Spanish and Indigenous language speaking immigrants in East Harlem. CREA is a woman founded/directed organization. While all are welcome, 80% of learners are women. 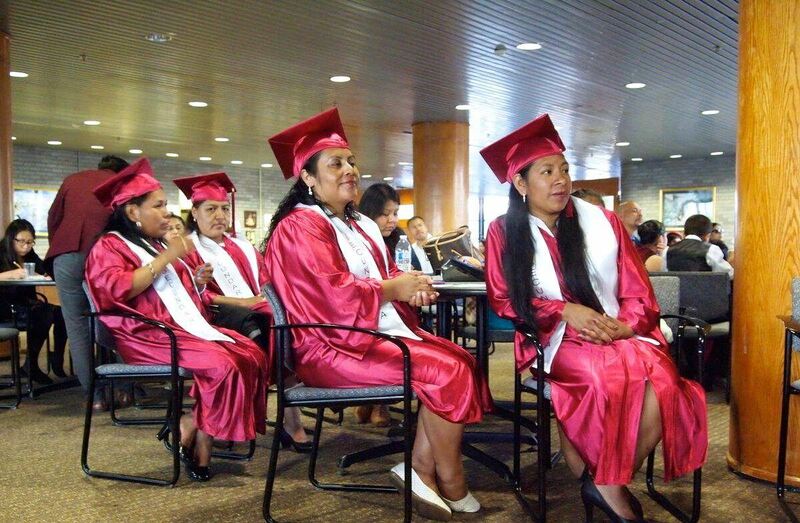 The women who founded CREA understand the need for a place where immigrants could learn English and augment their education. Many were unable to attend school in their home country because of poverty or gender discrimination. To succeed and to help their families to succeed it is crucial that immigrants advance their learning. CREA provides opportunities to do that. The center offers programming for elementary, middle school, and high school proficiency as well as ESL. 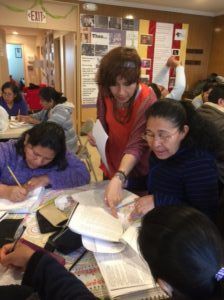 They also offer classes in Spanish for those who speak an indigenous language. CREA welcomes all learners, with the only confines being availability of space and instructors. CREA’s classes are making East Harlem a stronger community as the residents become more educated and are assuring the next generation is well educated. The school proficiency and language classes lead to better employment opportunities, and increased confidence. In addition to language and educational classes, CREA offers workshops in a variety of social justice subjects, and leadership training. Mary’s Pence is pleased to support CREA’s work to enhance the ability of immigrants to succeed in their new home and form strong communities. Written by: Kaye Cassidy, Ignatian Volunteer at Mary’s Pence. Learn more about the Ignatian Volunteer Corps. Learn more about Mary’s Pence Grants.